Thank you for visiting the Georgia DECA Foundation website today. Our mission is one of fundraising to support Georgia DECA chapters and students having financial needs to participate in DECA’s internationally recognized leadership program. We are a 501C3 corporation whose tax-deductible donations come from corporations, chapters, advisors, students, and folks like yourself. Our distributions go directly to Georgia chapters and students through our ASPIRE Fund and do not support the day to day operations of Georgia DECA. Georgia DECA is a state Chapter of DECA, a 72 year old co-curricular student organization with over 225,000 high school students in all 50 states, Puerto Rico, the Virgin Islands, Guam, and 7 countries around the globe. Georgia DECA’s current membership has surpassed 12500 in 148 chapters around the state. The numbers continue to climb as the program has been expanded into several middle schools under the guidance of “buddy” high school chapters in their districts. Georgia remains fourth largest state chapter in DECA world-wide. Georgia DECA has just completed its annual state conference(CDC) with attendance exceeding 2400. Academies were packed, and several additional sections were added to competitive events as students wanted to compete for the right to attend DECA’s International Conference(ICDC) in Orlando, April 27-30. The Foundation will pay ICDC registration fees for all 1st place winners plus issue financial stipends to needing student qualifiers to help defray ICDC expenses. In addition, we awarded five $1000 college scholarships to deserving students. I get much personal satisfaction in making these distributions. In Orlando, students will be competing for over $300,000 in scholarships and attending workshops to make their DECA experience even better. You can help in two ways. 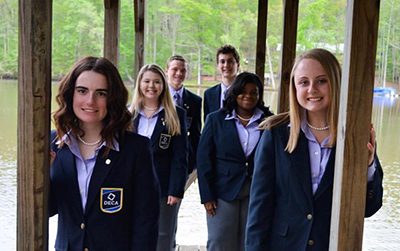 Local Georgia DECA high school chapters need business mentors to support student preparation for international competitions. They will be competing with over 18000 other students from around the globe and the competition is fierce. You should just contact your local school and ask to speak with the DECA advisor to offer your services. Secondly, we are appealing to DECA alumni and the business community to support our 700 winners by donating to the Foundation. A “Donate” button is in the upper right corner of this page. It is that easy and the students and advisors will sincerely appreciate your assistance. The fact you are here means a lot to us. 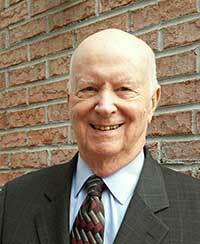 Please take a few moments to look us over and review our profile on www.guidestar.org. We are thankful for the continued support of our current “Friends of Georgia DECA” and look forward to adding new ones. Support GA DECA when you shop on Amazon or EBAY! Everyone can support the Foundation when using Amazon, and E-Bay. Just designate us a favorite charity and a portion of purchase price or proceeds will be donated directly by them. It's an easy and no cost way for you to support the ASPIRE Fund for student scholarships. 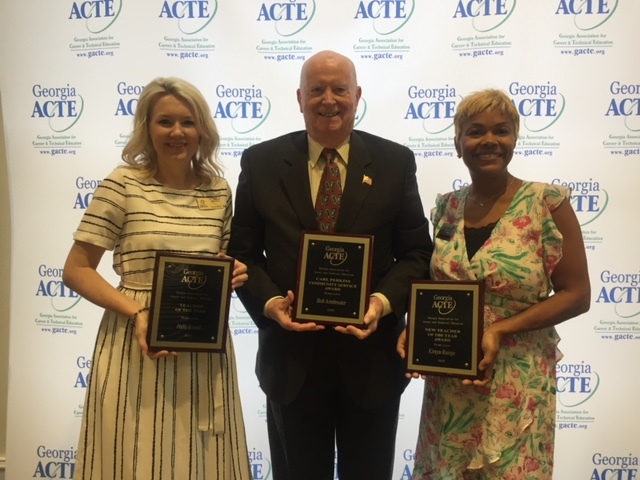 Left to Right- Teacher of the Year, Halie Bissell, East Paulding HS--- Bob Armbruster, Carl Perkins Outstanding Service Award New Teacher of the Year, Kimya Rainge, South Gwinnett HS… CONGRATULATIONS!! !